Look­ing in on the West­side of Ern­ster it is dif­fi­cult to imag­ine that long before a large fish pond was stamp­ing this land­scape, where today mead­ows and pas­tures are spread­ing. In old times peo­ple often set up a fish pond near run­ning waters or in marshy and heavy soils, not adapt­ed for agri­cul­ture. 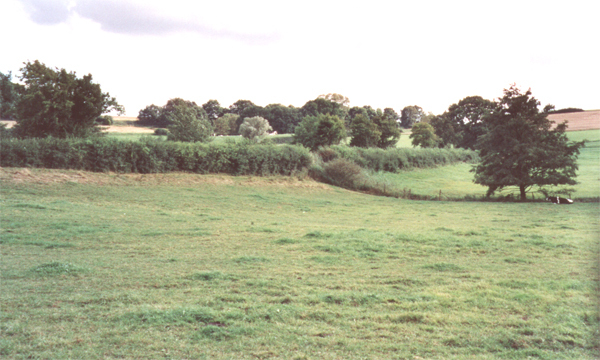 The bank of the old fish pond is still there today. 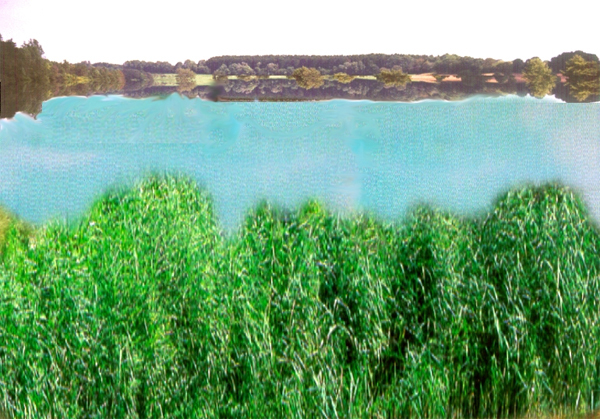 The small run­ning waters were tail backed by small soil mounds and rivers by mas­sive ram­parts. 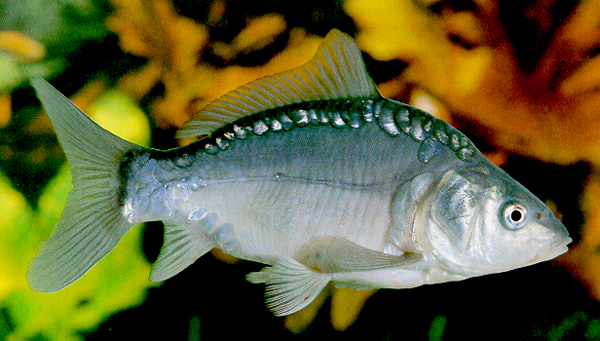 Most often carps, pikes and tench­es were raised in these ponds. But lat­er on most of these ponds had been drained and dis­ap­peared from the scenery. 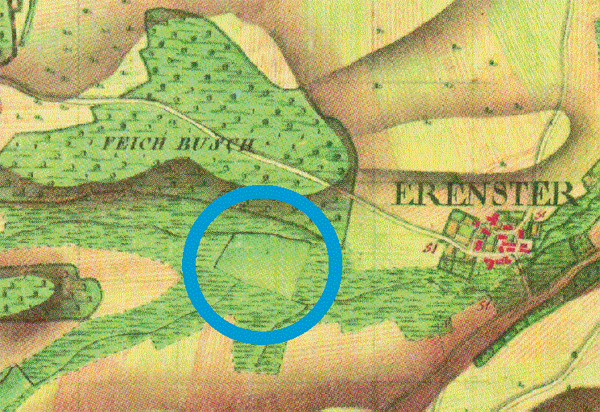 Rep­re­sen­ta­tion of the fish pond on the old Fer­raris Map of the 18th cen­tu­ry. Only old maps (Fer­raris Map 1771–1789), engrav­ings or old ram­parts are remind­ing us of these old fish ponds. The ram­part, hold­ing the Ern­ster Riv­er is still to be seen today as a wit­ness of the past activ­i­ties. The fish ponds being often part of a noble’s, a monastery‘s prop­er­ty or even of a com­mu­ni­ty or pri­vate per­son became worth full for rent­ing, paw­ing or just improv­ing the finan­cial sit­u­a­tion. 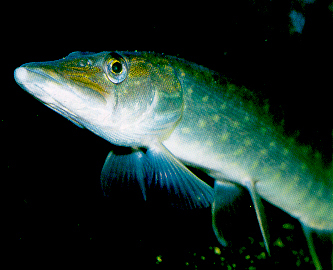 Carps and pikes among oth­ers were raised in the pond. Most of the ponds had been rent­ed by butch­ers, because, in order to keep their busi­ness going even on the numer­ous fast­ing days (3 lat­er 2 per week) or dur­ing the lent, they could then sell fish to their clients. In the year 1699 such a ten­an­cy agree­ment had been worked out by a butch­er from Lux­em­bourg city, Mr Johann Wit­ter and a rich pos­ses­sor from Schit­trin­gen, Mr Jakob Dumont. The butch­er rent­ed three quar­ters of the Ern­ster fish pond. Anoth­er inter­est­ing rea­son for the cre­ation of these ponds was the fact that dur­ing the sum­mer, it was impos­si­ble to store any meat, so that the butch­er could offer fresh fish to the pop­u­la­tion.